Wow, what an insult to shareholders. Instead of releasing 2009 earnings results this coming Tuesday, broadband services provider RCN (RCNI) decided to sell the company instead. For a insultingly low price. HERNDON, VA--(Marketwire - 03/05/10) - RCN Corporation (NASDAQ:RCNI - News) and ABRY Partners today announced their entry into a definitive agreement for an investment fund managed by ABRY to acquire RCN for total consideration of approximately $1.2 billion, including the assumption of debt. As part of this agreement, each share of RCN common stock issued and outstanding immediately prior to the effective time of the merger will be entitled to receive $15 in cash, representing a 43% premium over RCN's average closing share price during the past 30 trading days and a 22% premium over the closing share price on March 4, 2010. The transaction has fully committed financing, consisting of a combination of equity to be invested by ABRY and debt financing to be provided by SunTrustRobinson Humphrey, Inc., GE Capital, Societe Generale, and certain of their affiliates. The nonsense about "Total consideration of approximately $1.2billion" ignores the fact that they're buying the STOCK, for $15 per share, or about $540million. They are (appropriately) assuming the debt, not retiring it, seeing as the company covers their interest expense nearly five times over. There is no "management commentary" accompanying the release, for good reason. What are they gonna say - "We've sold the company for an absurdly low price, and in exchange management will have extremely lucrative contracts with the new owners. Good Bye." The company is selling right as cash flow will start to kick up hugely, thanks to moderating capital expenditures. 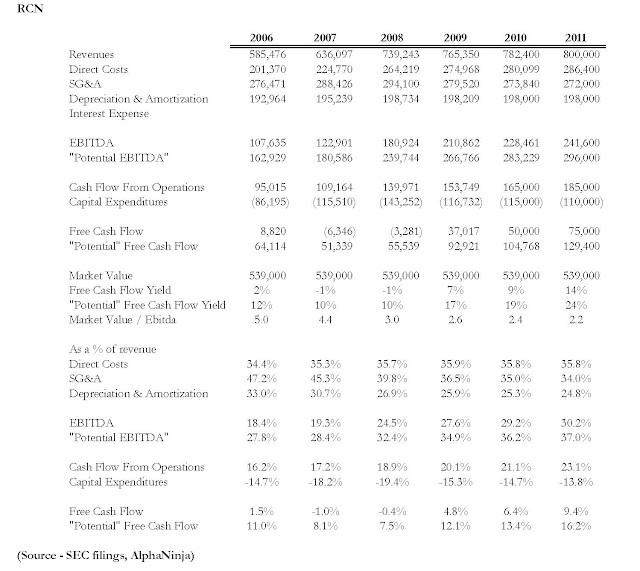 I included a "potential Free Cash Flow" analysis below, to show the cost-cutting that will happen as RCN goes private, none of which benefits existing shareholders. What a shame. For once, I'm on the side of the lawyers, who immediately used their "automated lawsuit robo-blaster" to launch action against the company.